I wanted the ability to create a printout that only had the markers I wanted. I figured others might want this as well, so I made it available online. I have support for all the official markers for N3 and HSN3, and several user-contributed markers as well. You can make tokens of a variety of sizes. If you have any complaints or suggestions, please do not hesitate to let me know. Osterman, Postmortem, Griffapopolis and 38 others like this. Would it be possible to get the EVO supportware in even bigger size then 25? As far as I understand I only have one out to show what EVO is active and a bigger one would be more visible. As I understand it, the tokens are made up of a smaller inner circle inside a bigger circle with the space between the two circles being used for text. It'd be neat if sizes could be adapted for the inner circles to be 25mm, 40mm, etc for most status or states. That way, you could stand the model on the artwork and have the status text show - put magnetic tape or a flat disc magnet on the artwork of a laminated printout and a magnet under each base and you can even have the status move easily with the model. I imagine that a roughly 30mm printout of Prone to have your S2 cheerleaders stand on for an entire game could be a neat and low cost alternative to Customeeple's excellent acrylic status slices, for instance. I'd like to have some more options when it comes to Camo tokens' color and number combination. For example I'd like to print purple 40mm TO Camo with 1 for my Sphinx, and then 5 purple 25mm TO markers with 1-5 for rest of my Shasvastii. Right now I don't have the option of printing tokens with the same color and number, but in different sizes, not at the same time at least. This tool is awesome, I love it. It helped me make dozens of cheap tokens two years ago, and I recommend it to all of my friends. I could do that, although I've mostly stuck to keeping all status tokens as 25mm or smaller. I've received a lot of requests for smaller sizes over the years; this is the first time anyone asked for larger! If I added it to this one, I should really add it to all the rest for consistency. That could be possible, but it's difficult for me to size things very precisely. Not all of the images I have are exactly to scale, etc. Yes, that is definitely a limitation of the tool as it currently stands. I would need to completely redo the UI in order to support making sheets like that, and it's already quite cluttered and busy as-is. For now, I'm afraid you'll have to print two separate sheets if you want the same token in multiple sizes. Mahtamori, chromedog and Stiopa like this. Reece and toadchild like this. Ah, I see, you're calling out Overclock specifically because it affects all matching models, as opposed to being part of a single model's state. @toadchild: I've used your application and think it's great - thank you very much. 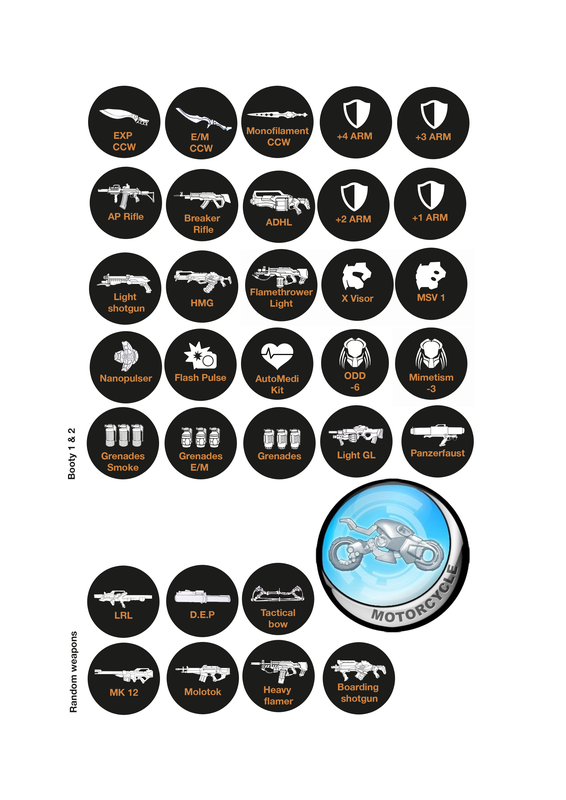 One hopefully helpful suggestion - for proxying purposes, would it be possible to also choose tokens with some of the weapon names on them? (I.e. "HMG," "Spitfire" etc.) That way players who are proxying could put an appropriate token next to the model in question, to help remind their opponent that "that Garuda over there is actually carrying a Spitfire not a CR" and whatnot. Just a thought and thanks again! I like the idea, but I'm probably not going to do this. 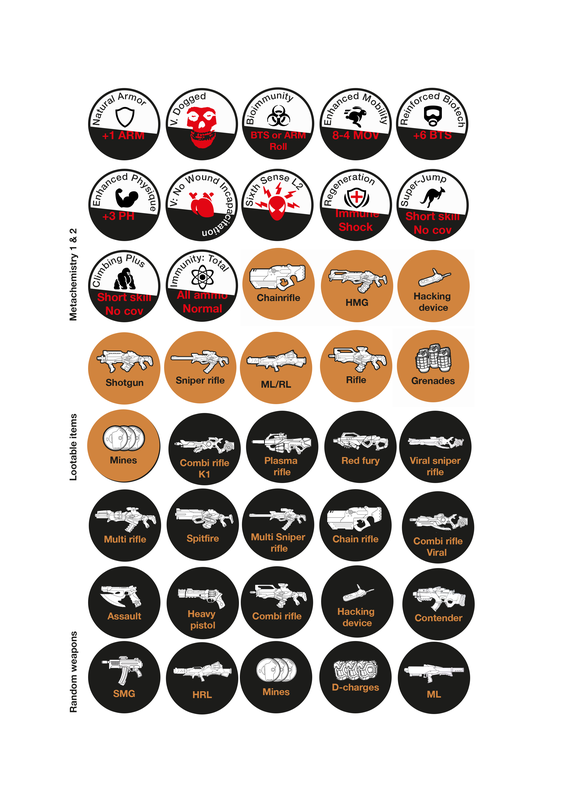 I'm mostly interested in reproducing actual game markers, with only a few edited or extra ones for obvious holes in the line (such as putting numbers on things or adding extra color variants to differentiate duplicates). I also don't like to try and make my own art or layouts, because those are not things I'm very good at. I also don't like to try and make my own art or layouts, because those are not things I'm very good at. Copy weapon image from profiles and done? Also useful for booty and scavenger, BTW. And by extension, maybe metachemistry can get some kind of markers (which will need art, or just be text). I doubt my ability to make it look good. Love your token maker! Thanks! I second the Booty and Meta Chemistry tokens. 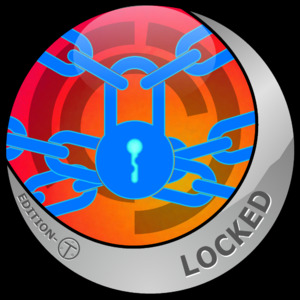 I would also suggest a Locked token for TAGs and a Data Tracker token. I understand the desire for Booty/Metachemistry tokens, but someone else will have to undertake the artistic side of that project. I don't have Locked (I don't think they've released that one in any of the official token sheets), but I do have the Data Pack marker contributed by @Tristan228. xagroth and Abrilete like this. Reece, caballocodrilo, Mahtamori and 4 others like this. Thanks! I've added it to the page. Barrogh and Abrilete like this. toadchild I did metachemestry tokens and also weapons for looting, you can get the photoshop file if you like. Would be fun if you wanted to use them. Hachiman Taro, Barrogh, Space Ghost and 2 others like this.